Yeah, but he is much more fun as a god. Following up a critically acclaimed game can be tough. It can be even tougher when it’s considered one of the best games on its system. So what are some ways to make a successful prequel to an entire series that has grown with each installment? 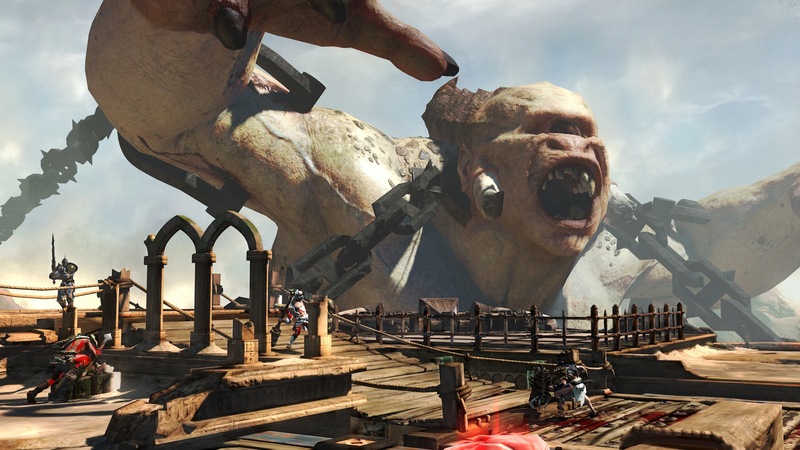 The answer does not lie within Sony Santa Monica’s God of War Ascension. Kratos has done some incredible things in his lifetime. He went toe to toe with the god of war, turned back time to prevent his own death after he was already killed, and single-handedly waged war on Olympus, Hades, and the Titans in between. With this kind of resumé, one may wonder what kind of awesome things he had to do before he started his journey in the first God of War game. Sadly, by this point in the series so many major players in Greek mythology have been used that all Ascension is left with is a few recognizable names here and there, and some unknown beasts in between. The most recognizable beings are also the main antagonists of Ascension’s story, the Furies. These women/monster hybrids are the elite police of the pantheon, hunting down and torturing people who have broken or intend to break a blood vow to a god. Kratos finds himself in the clutches of these ladies at the opening of the game, and his time leading to his capture is told through flashbacks, which take up about 90% of the story. Story is a term that I use very loosely here, seeing as there is very little plot development. By the end of the game Kratos has literally only traveled about a quarter mile from the where he started, relying on his memories to do the heavy lifting in terms of narrative. This feels very odd, though, because Kratos gains abilities in his flashbacks that he doesn’t have in the present until he goes through the memory in which he gets the power. These powers vary from past God of War games in which Kratos would gain an arsenal of weapons that he could switch between by swapping them out for four different elemental types, which have very little difference from each other. Fire, ice, electricity, and soul can be swapped on the fly with a press on the D-pad. I found myself sticking solely to fire for the majority of the game, since there is no visible penalty or advantage for using different elements on different enemies, even those attuned to certain elements of their own. This large scale set piece lends itself well to multiplayer, but I only wish there were more maps that do things like this. The combat still feels similar; Kratos swings his Blades of Chaos around like we have always known him to, but small tweaks to the controls make what should be minor changes feel more prominent. The main change that stuck out to me was that parries can no longer be activated by a well timed block, but are now designated to their own two button input, which made me not even bother to try to parry when I could have used it most. Other changes such as one button secondary weapons and a rage meter that depletes quickly with every hit make the combat feel like a step down from God of War III. Surrounding the combat are the set pieces that the series is known for, and most everything is here from God of War III, but that isn’t always a good thing. The game still looks fantastic, and there are moments where the sense of scale is expertly done, but everything feels like it is chasing at the tail of God of War III, almost to the point of a checklist. Fight on the extremities of a giant monster? Yep. First person face punching? You got it. Original ideas? Nowhere to be found. The larger scale battles are also hindered by a rebellious camera that likes to zoom so far out that you can no longer tell where Kratos is or what he is doing. The biggest change, and most positive one, is the addition of multiplayer in Ascension. Where many sequels will include tacked on multiplayer experiences, Ascension feels like it was built around the new mode. The combat feels natural, even in fights involving multiple people, and all of the changes made to the combat and controls make sense here. Most game types revolve around gathering favor by killing enemies or performing tasks like capturing points and opening chests, and they are all enjoyable in their own way. If God of War Ascension was to give any reason for its existence, the multiplayer would be it. We are at the end of a console generation, and while I do not expect there to be anything grand in terms of new tech brought to this series, I am still looking for, and expecting, creativity. Ascension feels dry of any imagination, running down a checklist to make sure it covers all of the big bases from III, but without the cast or narrative to back it up. The multiplayer is the saving grace of the game, but in the end, that is not good enough to compete with the other action games on the market. A good game, experience is epic like every other GOW games. But gameplay is kinda frustrating! Enemy A.I is not done very well, they fight like enemies from Ninja Blade, meaning they only attack you once you start your attack. Rage meter combo is the only way to go but how can you reach it when enemies ALWAYS interrupt you? Pacing is very intensely boring, feels like GOW1 but more boring.